Q: My John Deere 318 garden tractor with an Onan 18HP engine surges or pulsates under no load. When the PTO is engaged with any attachment the surge disappears? I bought it used last year and it is a great work horse. A: It sounds to me like you have water or dirt in the carburetor. Take the top off and check for dirt or water. Take out the front jet toward the muffler, blow air through that orifice. Put it back together and adjust that air screw by the muffler and I would like to think everything now would be O.K. Q: I have a Simplicity 9020 garden tractor with a tired Onan engine. I’m wondering about replacing the engine, or rebuilding it. Are parts still available for Onan? A: Onan is slowly going out of business as they did not build an engine to pass our pollution standards. Our 23 horsepower Vanguard engine is by far the best way to go and is the best air cooled engine that money can buy. Q: I have a 1987 John Deere 420 garden tractor with an Onan 20 HP engine and it surges. When I remove the air cleaner I can see the fuel being squirted into the carburetor when a surge comes. I have rebuilt most of the motor and installed a new carburetor and it is still doing it. Do you have any advice? Do you have a repower in a Vanguard? A: It sounds to me like you have a leaking intake manifold. The way they have built the intake manifold is a bad design. Yes we have a Vanguard V-Twin overhead valve engine and made to order installation kit for your application. Q: I have an Onan P218G with electronic ignition in my John Deere 317 garden tractor. It Runs great. I replaced the rings about 2 years ago and so the engine is clean inside. When I start it, it often kicks back. Sometimes it locks up the starter. When it does this I have to take off the side cover and pry on the cooling fins to turn over the engine a small amount to get the starter to work again. I took the engine out and checked to make sure the flywheel key was not broken off, it wasn’t. I replaced the spark plugs and this seemed to help some but now it is kicking back and locking up the starter again. It even unscrewed the nut on the starter twice and I had to take the engine out to put the nut back on. Do I need a new electronic ignition? A: When you had the engine out did you check the 2 holes in the block where the 2 starter bolts go through? You need to make sure one of those holes or both are not cracked or broken. You should replace that electronic module inside the flywheel. Also there is an electric ring slid on the crankshaft, that should be inspected and or replaced. Q: I am the owner of a John Deere 420 garden tractor. I have been very happy with it since purchasing it used 6 years ago. Recently I have been having a problem with it losing power and shutting down after running for about 20 minutes. After checking it I discovered the spark is not there. What could be causing this situation? I think it is the Ignition coil or stator, can you confirm this for me? It is a P220G with an electronic ignition. A: It would not be the stator because that has nothing to do with the ignition system, and yes it can be the ignition coil and or the ignition module located inside the flywheel. One wire going to the positive side of the coil is correct on a P series Onan engine. Yes, there should be a module mounted close to the crankshaft under the flywheel. 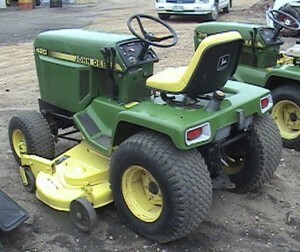 I have a John Deere 318 with a p218g Onan engine. I have been trouble -shooting and determined the ignition module needs replacing. Since it is located on the gearcase behind the flywheel it appears to be impossible to get to without major dis-assembly. I was wondering if I can disconnect the old and add the new and mount it elsewhere on the engine top. Need to know, also, where the red and black wires connect to in order to pull this off. This control module needs to be mounted where it was, to control the correct timing for the 2 cylinders. It is triggered by a moving magnet on the crankshaft.